This game reviewed a O rating due to pixelated blood and gore, and mature themes and horror. The Game Kitchen's point-and-click adventure horror game The Last Door: Chapter 3 begins with a bang and a lot of heavy breathing, as following the disturbing events of Chapter 2, our hero wakes up in a coffin and stumbles out from the dank underground cell to find himself in an unfamiliar city. Everyone thinks he's just another drunkard as he stumbles through the dirty streets, lost in confusion and memories, and he can't figure out where the ticket he found in his pocket has come from. When night falls, however, he has more things to worry about than callous indifference, and the streets get even darker and stranger. To play, just click when the cursor changes to interact, and click to highlight items in your inventory for use on the screen. One of the puzzles is audio-based, but since the game thoughtfully comes with a closed captioning option, you can complete it even if you have difficulty hearing. In fact, the game comes with a lot of options to make things easier for all players, so make sure you check the opening screen to see if any of it applies to you! Chapter 3 feels a bit more tightly designed than its predecessor by being more adept at balancing narrative and gameplay, so you'll do a lot more exploring and puzzle-solving than having people yap at you. That's not to say the narrative is light here... if anything, this third installment provides a lot of interesting context to some characters and their relationships. It's just that the series also returns to more of the exploration and puzzle solving that the original leaned heavily on. None of it is what I'd call difficult, though it can be easy to miss things since the game's colour scheme is so dark in places as to make it hard to tell what you're looking at until you click on it. You're often given little direction when it comes to accomplishing tasks, so experimenting is a must... this is an adventure game, after all. You didn't think you were going to get out of it without rubbing that broken mask on everything from the paintings to that horse carcass to see if that was the key, did you? As far as tone, however, Chapter 3 might be the strongest the series has offered, with an ethereal, otherworldly quality to the setting. It feels menacing, tense, and subtly wrong in a thousand unsettling little ways, and the jump scares (yes, again) are executed with more finesse. The sound design here is particularly excellent, which makes playing with it turned up a harrowing treat. The game ends on a big cliffhanger that sets a new record on the Creepy Meter, and the fourth and final installment of this first "season" will have a lot of work to do if it plans to answer most of our questions and provide any sort of closure. 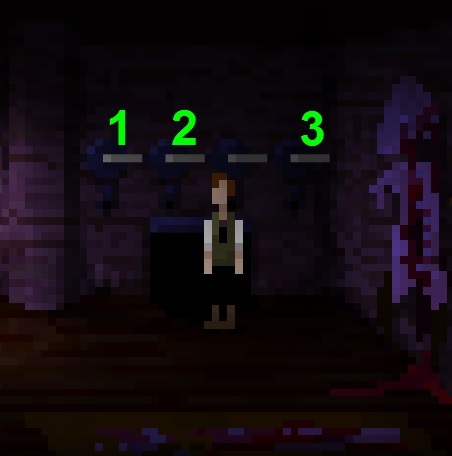 The Last Door: Chapter 3 is a superbly crafted adventure that's scary without resorting to a lot of gore and violence, so turn the lights down low and the volume up high, and let it raise the hair on the back of your neck. Though Chapter Four has been released, it's currently only available to people who donate towards funding the next season in the series, though it will be available freely in the summer of 2014. We will wait to cover each chapter until you can play it freely. "Enhanced" versions of each chapter containing sharper visuals and translation options are available on the site. More information is available here. The Last Door: Chapter 3 Walkthrough now available! Click anywhere on the screen after each line of text appears to bang on the door. After the third line, "All is silence," click the darkness again to break out. Once you appear in the forest (after the credits are over) walk towards the right. You'll be interrupted by a few short cutscenes, just keep walking right until you reach the end and Devitt wakes up back inside the cellar. Exit through the door on the left then walk all the way right. Go out the next door to exit the building. Continue through the door on the right to reach the Old Nichol Street Rookery. Walk to the right past the horse meat vendor until you approach a mysterious red-headed man and a woman standing at the corner. Along the way, take note of the alley in the middle of the road that's currently being blocked by a large cart. When you approach the mysterious man he will run off and close the gate behind him, blocking that path. Take the other path through the open doorway on the left to reach the Back Street. Examine the bottom of the flowing pipe at the side of the left wall. Click the water coming out of the pipe to have a drink. Take a few steps in any direction. Devitt will collapse after drinking from the pipe. At this point the scene will automatically transition from day to night. Exit the area through the open doorway to return to a now darkened Old Nichol Street Rookery. Go left until you reach the part of the street that was blocked by the cart during the daytime. Now that it's night the street has become empty, allowing you to continue forward into the Alley. Take the middle path to reach a street corner with a boarded up window, a street lamp, and a door. Open the door and go inside the Butcher Shop. Walk to the right end of the room where you'll find a dead horse and a row of candlesticks mounted on the wall. If you click the candlesticks you'll notice you can turn them up or down. Far left candlestick - Inner left candlestick - far right candlestick. Go through the small door that opens under the candles to enter the secret Distillery. Pick up the EMPTY BOTTLE on the floor in front of the filtering machine. Examine the glass essencier at the left side of the room and note that it can be used to remove impurities from liquids. Exit the building and walk left to return to the Alley. Go up the stairs on the left side to reach the Fortune Teller's Street. Take the lantern hanging from the hook by the fortune teller. The mysterious man is waiting for you again at the right side of the scene. Walk right towards him, then follow him into the next street. From there, rather than chase the mysterious man, go through the broken grate at the bottom of the right building to enter the Sewer. Inspect the pool of water on the ground underneath the two large pipes. Use the EMPTY BOTTLE to collect some of the water - the bottle is now full of OILY WATER. Go back outside then walk right to chase after the mysterious man. The man will open the door on the right and enter the building, but it's too dark for you to continue after him. Instead, walk to the street on the left to return to the Alley. Take the middle road and enter the Butcher Shop building, then return to the Distillery through the secret doorway. Pour the OILY WATER into the essencier found at the left end of the room. Use the EMPTY LAMP on the essencier to collect the filtered oil. Leave the building and walk left twice to return to the Fortune Teller's Street. Use the LAMP (which should now be filled with oil) on the smoldering fire by the fortune teller's feet to light the lantern. Walk right twice to return to the street where you last saw the mysterious man, then go through the doorway on the right to enter the Foyer of the decrepit manor. Examine the rack hanging on the wall. Search inside the coat to find a pair of GLOVES. Go up the stairway to the Upstairs Corridor. Walk left to the end of the hall, open the door, and enter the Musician's Room. Click the violinist to speak with him. Ask him a few questions to find out that he's having difficulty composing music now that he's lost his muse, Daphne, who used to stand by the window where the mannequin is now. Note the few phrases he uses to describe her: "The wind caressed her cheeks, it danced in her golden hair; her dress glowed like an ember in the dusk sun." This description of Daphne sounds an awful lot like the woman depicted in the large portrait in this very room. Inspect the table to the right of the musician and take the rolled up SCORE. Go back out to the hall and walk right until you reach a ladder leading to the ceiling. Climb up to enter the Attic. Take a look at the piano then click it to try to play a few notes. Click the piano a third time to discover a KEY hidden in the keyboard. Examine the bottom of the large birdcage to find a feather just out of reach. Go back down the ladder to return to the Upstairs Corridor. Walk to the closed door on the right, then open it and enter the Dancer's Room. Talk to the old woman sitting on the bed. After you talk about all three subjects with her ("Who are you" "I want to get out of this place" and "Weird Man") she'll ask you to go to the fireplace and play hide and seek with her. Click the space on the wall between the fireplace and the bed to play the game. After it's over, search the pile of things on the floor and pick up the BROKEN MASK. Use the KEY you found inside the piano in the attic to unlock the wardrobe. Take the scarlet DRESS from the opened wardrobe. Next, use the GLOVES on the fireplace to safely pull out a DOORKNOB. Leave the room and go back down the stairs to the Foyer. From there, walk right, open the door, and go out to the Backyard. Inspect the stump beside the pile of chopped wood. Use the FEATHER to collect some of the sticky resin from the stump. Combine the RESIN-COATED FEATHER with the BROKEN MASK to repair it. Go back inside the house and return to the Upstairs Corridor. Walk to the last closed door on this floor, to the left of the ladder, where the sound of laughter is loudest. Attach the DOORKNOB from the fireplace in the Dancer's Room to the broken door. Open the door and enter the Bathroom. Click the curtain concealing the bathtub to open it. Click the gramophone to turn off the record. Take the blonde WIG from the doll inside the tub. Exit the room, walk all the way to the left and re-enter the Composer's Room. Use the objects from your inventory to dress up the mannequin at the window according to the portrait of Daphne. Place the FIXED MASK (that you repaired with the resin), the scarlet DRESS (from the wardrobe in the dancer's room), and the blonde WIG (from the doll in the bathroom) on the mannequin to complete the facsimile. The composer will reward you with a VIOLIN and a BLACK KEY. Leave the room and go downtairs and outside to the Backyard. Walk all the way right to the locked black door. Unlock the door with the BLACK KEY from the composer. Continue right to enter the mausoleum. There's a crypt but there's no coffin! It looks like you'll need to keep searching for a place to put the violin tribute. Go through the large hole in the right wall to reach the Side Street. Click the closed door beside the dirty window. Although it's locked, if you take a few steps away you'll hear a knock on the door from the other side. Click the door again to look through the keyhole... Nothing? Click the door a third time to peer through the keyhole once more. Go through the open door to enter the Bookstore. Read the open book on top of the counter. The poem gives a clue to Daphne's whereabouts - "Daphne hid from the Sun in the shadowy mists. She changed her skin for strong bark so her heart was forever concealed, her dance frozen in the rustle of a thousand leaves. Walk right to access another room of the bookstore, where you'll find a gentleman sitting and reading on the sofa. You can talk to him if you like, then continue left into the third room of the bookstore. Walk left to the fourth bookcase. Examine the open book on the floor by the bottom of the bookcase, then click the book again to read the marked page. Continue left to the giant dead tree at the end of the room. Examine the book at the bottom left corner of the ground and then take a look at the torn page stuck in the tree branch above the book. Take a few steps to the right and go down the hole in the floor to enter the Sewer Tunnels. Walk left to go deeper into the tunnels. Move right a couple steps and read the page on the ground. Continue right until you reach the cracked roots of the giant tree. If the haunting singing wasn't enough of a clue, remember the passage from the poem: Daphne went to a shadowy place hidden from the sun where her heart was concealed by bark and leaves. Place the VIOLIN inside the crack in the tree roots. Go back through the door on the left and up the stairs to return to the Bookstore. When you enter the room you'll see the tree has grown and broken through the window and out to the street, along with the torn page you need! Walk right twice and left once to leave the bookstore. Open the gate on the right and go through, then walk left once. You'll find yourself back at the Fortune Teller's Street. From there, go up the stairs to reach the Alley. Examine the huge roots bursting out of the broken wall and take the PARCHMENT at the end of the lowest root. Read the note on the parchment. It won't make much sense now, but keep the poem in mind. It'll come in handy very soon! Follow the mysterious man to the next street on the right. Continue to chase after him into The Fog. Walk to the right and pay close attention to the sounds you hear as you move. Note how each sound seems to originate from a certain point. The noise will get louder as you move closer towards it and softer as you move away. You may hear a few of the following sounds: a flock of birds, the waves of the ocean, buzzing cicadas, gusts of wind, or absolute silence. Take another look at the poem on your PARCHMENT. Every odd line in the poem contains a clue. The first line mentions the Wind, the third line mentions the Birds, the fifth line mentions the Sea and the seventh line mentions Silence. All of these are sounds you can hear in the fog! Now that you know what to look for, you just need to follow the directions of the sounds in the same order as they appear in the poem, starting with the Wind and ending with Silence. First find the landmark where the wind is loudest. Next, click the foggy background in the spot where the sound of wind is coming from to travel deeper in the fog. If you're having trouble finding the right direction of a certain sound, press the 2 key to activate the closed caption descriptions. Look for the phrase describing the sound in the black bar at the top of the screen. For example when the caption "Wind" appears on the left end of the captions bar, that means the sound of the wind is coming from the left side (and the reverse is true if the caption appears on the right). Repeat the same process to locate the remaining three sounds and escape the fog. Remember, the pattern is Wind - Birds - Sea - Silence. If you clicked the fog around the correct area, Devitt will continue to a new area within the fog. However if you chose incorrectly, you'll be sent back to the beginning where you'll have to start over. After you escape the fog maze walk all the way to the right. Follow the mysterious man out of the fog to reach the Estate. Give the TICKET from your inventory to the mysterious man. Click the door to enter the building. Walk right to the end of the hall then click the last window to enter the theater. Move to the middle of the room and click the red curtain to approach the stage. When Alexandre asks for the reason you joined the group, select "True philosophy." Take the mask from Alexandre's hand. I am pretty sure that the new layout is not ready yet for primetime. If you were to remove these pages "https://jayisgames.com/archives/_includes/entries/description-12631.php", it would make the new layout far better. though that may be intentional with every space looking the same. I was dismayed to find a pixel hunt in a section that I'd automatically checked, but it may have been just me. So I got mired in trying to play the game instead of experiencing the narrative. And the game by itself wasn't that interesting or mysterious. Instead of looking for solutions, I was just looking for physical properties of items. But again, that could go with the theme. Sort of. Although I used the accessibility options to get over this machine's lack of sound, I couldn't quit follow what I was supposed to do when things were overlaid. I think it wasn't so much whether the disorientation / labyrinth theme was clumsily done, because that's a great old trope that's rarely tackled well. It was more that I didn't really feel the obsession. I mean, it's *obsession*. This felt way too subtle. Obsession isn't subtle. It should sniff your hands and follow you home and live on your roof muttering about your eyes. That void kind of sapped whatever slow, turning screw that should have been the labyrinth. I was suitably lost, but my blood was not curdled. One thing missing from the horrible new site layout is an appropriate place to complain about the horrible new site layout. It's about time JIG got a forum for feedback, game suggestions, community spirit etc. Use the score to blow the feather out of the cage? REALLY!? Dandy, the new site layout has been designed by Tatyana Orlovich (http://multadroit.com/) a good friend of Jay (they were at the same university). Tatyana has began to work on the website for Jay since a while so I suppose she perfectly knows the community spirit. Don't worry Jeff, this site layout is very good. I like a lot the comments and the walkthrough on the game page. And this page with the grey box for the game has really a better look than before. Maybe you forgot it but I do not see the box with the comments? 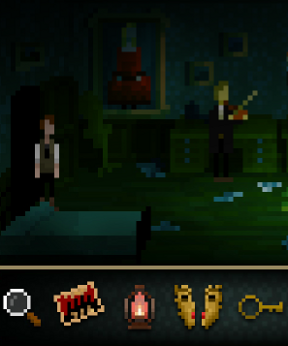 To come back to The Last Door: Chapter 3, this game is for me one of the best I played recently. Unless I'm missing something the light switch button seems to have been removed from the new layout so you can't make the area around the game window darker anymore...this kind of ruined the game's atmosphere for me. I also find the grey box distracting. Hello Shak82 & Ganx, you're right some elements are still missing. We will add them within next days. IlanIvasko, I feel you. That was TOTALLY the one place I got stuck myself and I had the same reaction. I would have liked some sort of context clue in the description. Maybe something like "Rolled up like this, you'd be able to blow through the paper", and then the feather could say "Perhaps if you were able to blow it out" so you could make the connection through context. I too was stymied by the score. Did anyone else successfully navigate the fog using only sound? I couldn't manage to hit the right spot unless I turned the captions on, which is kind of a bummer. It hardly ruined the game for me, but it stuck out as one puzzle whose implementation seemed lacking. When you click on the developer name, there are 4 entries for each game for some reason. One pointing at the review page, one for walkthroughs, one for comments, and one for I forget. Something's not working. I'm guessing it's got something to do with the new format, which I would also like to vote against. But I'll give it some time, maybe it'll grow on me. For once, I didn't have trouble with that game mechanic, Jason. You find the place where the sound is strongest and click there. I did have trouble with the score though. It was very unintuitive. Loved the story about Daphne though. Cool imagery. 1) I had no trouble with the lovely audio puzzle. In fact I jump in giddiness every time a developer throws one in, knowing that they are not too popular in this modern world of us that pays so little attention to careful and discriminating listening. 2) I knew immediately what to do with the score :-)))) OK, lying through my teeth here, I had to scratch my head a bit until it popped, but I think it is fine as it is and doesn't need any more explanation. I like what these guys are trying here. Not the game itself, exactly, which is fine but not exceptional, but how they are trying to create a community around it. Oddly enough I immediately figured out the feather puzzle...sort of. Admittedly I thought Devitt would use the rolled-up score to reach out and drag the feather to the edge of the cage, but.... tomayto, tomahto. Does this mean we have all four witnesses accounted for? Anthony, Father Ernest, Devitt, and Alexandre? These games are incredible, I am such a fan. This is one of my favorite indie game series ever, the puzzle difficulty is perfect for me and I love the storytelling. GREAT job to The Game Kitchen team. I can't wait for the free version of Chapter 4 to go live. Hope this series has many parts to come! My only nitpick with Chapter 3 is how slowly Devitt walks in the dark segments/with the lantern. The walking pace in Chapter 2 was definitely the best.